Paddle Tines | HCC Inc. The Paddle has earned rave reviews from across the country. It’s the cost effective alternative to standard pickup combine tines when crop conditions make harvesting difficult and inefficient. The Paddle is packaged ten to a box, and includes Paddles, screws, and complete installation instructions. For more information, or to place an order, please see your nearest farm equipment dealer or contact the HCC distributor for your area. With its 6" width, the Paddle lifts and feeds crop that standard tines miss. Full crop contact provides positive and even feeding into the header. The Paddle helps reduce or eliminate the need for cumbersome and expensive air reels. HCC’s patented tine mounting system makes installation fast and easy. Simply remove one screw and replace the standard plastic tine with a Paddle. 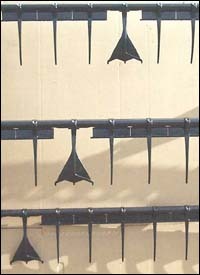 On wood bat reels Paddles install between steel tines by drilling one hole for each Paddle attaching bolt. Switching from standard tines to Paddle tines (and back again when desired) is quicker and less costly than other options. Thanks to HCC’s patented tine mounting system, installation is fast and easy. Simply remove one screw and replace the standard plastic tine with a Paddle. On wood bat reels, Paddles install between steel tines by drilling one hole for each Paddle attaching bolt. By limiting the number of Paddles used, you save installation time and money. In less than one hour, you can easily replace enough of your standard tines with Paddle tines to dramatically improve your harvest. "We ordered the Paddle to aid in feeding of the short soybeans due to the drought. The Paddle did a better job of feeding than expected. We just traded our 920 header for a new one, but we kept our Paddles! The quality and durability was outstanding. Thanks so much for making this product." "Worked great! I should have gotten some years ago. I won’t be without them. I always had trouble feeding a 30 foot head at both ends but your Paddles solved the problem. Thanks!" "The Paddles helped push the beans into the auger. The beans were only 4 – 8 inches tall and they would pile up on the platform. The Paddle would push them into the auger. With just the straight tines, they would begin to fall forward and fall off the platform." The specifications for Paddle Tines are subject to change without notice. Want more information on the Paddle Tines? Here are some helpful downloads.